Four back in Decorah. Photo credit Bob Anderson. Last week, Four took a little trip 22 miles northwest of her natal nest, although she has since returned and reconnected with Mom and Dad. What was Four doing? Will she ever permanently leave Decorah? How do we define and classify the behavior of a highly nomadic species like the bald eagle? I can't tell you what Four is thinking, but I can tell you a little bit about eagles and their movements. Dispersal is the movement of individuals from their point of origin (natal area) to where they reproduce or would have reproduced had they survived and mated. Navigation is an animal's movement around its territory or home range. Migration is the regular, seasonal movement of animals between breeding and non-breeding areas. 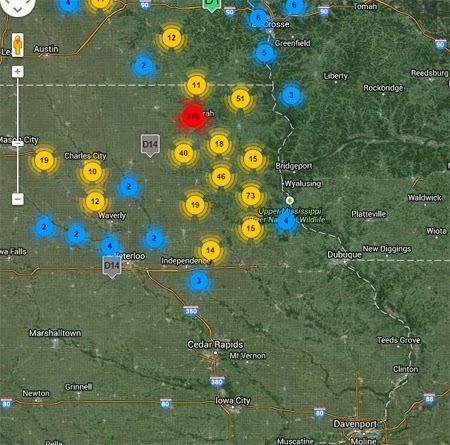 While D1 hadn't yet bred, she was clearly migrating back and forth between a non-breeding territory (Polar Bear Park) and a territory in which she would be likely to breed (NE Iowa). A detailed discussion of these theories can be found here, but all three dispersal strategies are linked to reproductive success. Inbreeding takes a toll on reproductive fitness in the long run, and kin competition can have immediate deleterious consequences, especially if kin are competing over limited resources. Colonizing new habitat disperses a population across a wider area, so local extinctions have a lower chance to kill every individual in a population. Having said that, D1, D14, and Four didn't sit down and check off a list of reasons prior to dispersing. Dispersal seems to be triggered by a number of factors, including hormones, body condition, reduction of parental provisioning, increased locomoter activity, and external factors that include favorable winds and full moons for night flyers. 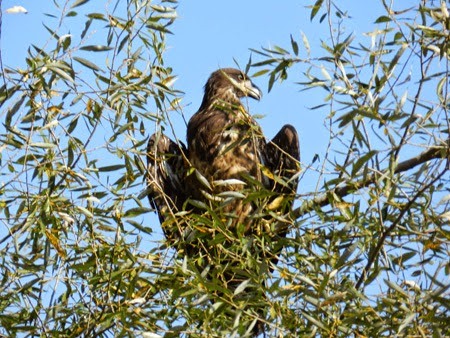 In short, our eagles learned to fly and hunt, Mom and Dad decreased feeding, an adrenally-produced hormone called corticosterone soared, and the eagles dispersed. Reports of Four and the other eagles playing 'tag' with Mom and Dad shortly before dispersal may really have been a hungry, hormonally-charged young eagle chasing down its parents in an attempt to secure food from them. Suddenly tag seems a little less playful. Unlike dispersal, migrating animals usually move from one geographic region to another without using intervening habitat. But are dispersal and migratory behaviors mutually exclusive in an highly nomadic animal that usually doesn't breed until it is four years of age or older? What limited data we have indicates they aren't. D1's first year had characteristics of both dispersal and migration. She left her natal territory on August 13, 2011 and flew 262 miles northwest, arriving at her northernmost destination on September 6th. She spent the next four months slowly traveling south, with long layovers at Yellow Lake and Black River Falls. She arrived back in NE Iowa on December 24th, 2011. D1 spent her winters navigating throughout NE Iowa and SE Minnesota, but she refined her north/south movements considerably. By 2014, her 808-mile trip north to Polar Bear Park took just 16 days. Although she wasn't yet breeding, her trips fulfilled the criteria for migration: they were seasonal, endogenously controlled, and didn't use much intervening habitat. So will our eagles choose to nest in Decorah as adults? It's not impossible, but it isn't likely either. Dispersed young may return to the vicinity of the nest, but they don't appear to spend time there as sub-adults or adults. A study of 878 bald eagles found a median natal dispersal distance of 42 miles (69.2 km) overall, with females dispersing farther than males. Unlike human families, the young do not return for a visit with grandchildren in tow. Does an eagle's initial dispersal or overwintering perambuation tell us where it might nest as an adult? 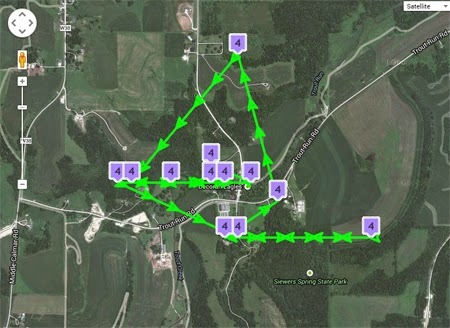 D1's favorite wintering area was near Elkader, Iowa, about 35 miles south of her natal nest - in line with average disperal distances. Unfortunately, her transmitter stopped talking to us. We'll try to get a visual on her this winter but we can't guarantee it. As I mentioned at the beginning of this post, Four is back in Decorah and reunited with at least one parent, although we haven't seen them feeding her. We'll let everyone know if she leaves again. http://www.nrs.fs.fed.us/pubs/gtr/gtr_nc190/gtr_nc190_062.pdf: Corticosterone and Dispersal in Western Screech-Owls (Otus kennicottii). James R. Belthoff and Alfred M. Dufty, Jr.
Will Four ever disperse? We've been asked that question via facebook, email, and our forum. Only Four can answer that question, but I thought it might be worth looking back at D1 and D14 for clues. The map above shows D1's first flights. She fledged in June, at 81 days of age, and we attached the transmitter to her on July 18, 2011. The maps shows her exploring her natal territory, traveling simple, short back and forth paths as she learns proficient flying, food-finding, and navigational skills. D14 was 78 days old when he fledged in late June, He is less centered around the nest and hatchery than D1 was, but his initial exploratory flights are very similar. Like D1, he is flying short, simple back and forth paths as he gains skill and experience. Four's fledge occurred at approximately 76 days old, in late June. Like D1 and D14, her early flight pattern is relatively simple - a lot of short back and forth explorations. Her first "loop" occurred on August 10 and was just 1 mile long (.5 miles out and back). So when does a hatch year eagle stop exploring and start dispersing? D1 was quite obvious. On August 13 2011, she flew north 14 miles toward the Iowa/Minnesota border. By September 6, she was 262 miles north of the nest. She turned south and came back to Decorah, arriving back in NE Iowa on December 24, 2011. Before leaving on August 13, she had never been recorded more than .98 miles from her natal nest. The map above displays D1's entire dispersal. On August 13, she went from local travel along simple paths to long-distance travel along more complex paths. Her large loop included several smaller loops with fewer of the simple back and forth flights that we saw her first weeks on the wing. 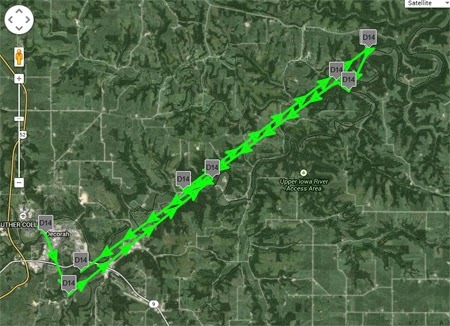 Unlike D1, D14 spent more time flying around the Decorah area and left town twice: once on September 5, for a 24-mile flight south, and once on September 22, for good. So did he disperse on September 5 or September 22? My money is on September 22. D14's movements seem to indicate a higher degree of pre-dispersal restlessness, but he didn't leave permanently until September 22. Like D1, he went from local travel along simple paths to long distance travel that included looping flight. Unfortunately, he died of electrocution on November 6 near Rockford, Iowa. The loss of D14 was tragic for personal and research reasons. Everything we could have learned from him ended in his premature death. We get a lot of questions about migration. Do the Decorah eagles migrate? Do our Peregrine falcons migrate? Where do they go when they leave? We fitted our eagles with tracking devices in part to help answer some of these questions. To date, we've learned D1's migratory paths and summer and winter ranges, observed an interesting difference in dispersal patterns between D1 and D14, and an interesting similarity between D14 and Four. I used to think migration was very simple. Like a lot of people, I thought that all birds except chickadees, pigeons, crows, and woodpeckers migrated once it got cold. They went south to escape snow and ice, returning to nest when the weather warmed up. 'South' was anywhere it didn't snow, or at least didn't snow much: Georgia, the Gulf Coast, South America. I had no idea that many birds don't migrate, or that 'south' could be Minnesota or Wisconsin. Peregrines, Snowy Owls, and Bald eagles taught me otherwise. Among birds, migration is the regular, endogenously controlled, seasonal movement of birds between breeding and non-breeding areas (Salewski and Bruderer 2007). Bald eagles and Peregrine falcons are partial migrators - that is, some members of the species migrate and others don't. This is the most common type of migration, which makes sense since migration is driven by a number of factors, including daylight length, food availability, weather, the time it takes to raise young, and the distance between wintering and breeding grounds. Migration allows exploitation of different habitats as environments change seasonally or successionally (Dingle, 1996). Food availability seems to play a very important role in the migration of Bald eagles: inland northern Bald eagles tend to move southward after ice and snow start putting a lid over their favorite food source - fish, while southern Bald eagles are thought to move northward once warm weather drives fish into deeper water (although there is some debate about this). Weather can also impact migration timing in other ways: for example, a favorable wind pattern might help compel a bird to leave for its wintering or summering grounds if other factors are in place. I also thought that birds used to travel the same path backwards and forwards. 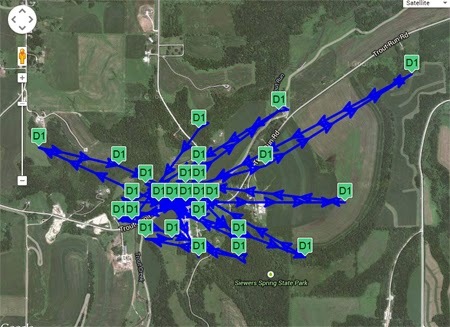 However, it turns out that many birds, including our own D1, favor loop migrations. This pattern might be a response to seasonal prevailing winds, food availability, tradition, and/or genetic influence. More to the point, loop migrations require more complex navigational skills (and perhaps inheritances) than a simple point A to point B path. Geographic mapping: When I'm in Minneapolis, I use a number of tall buildings to help me orient the city. It turns out that birds do the same thing, using landforms and geographic features such as rivers, coastlines, and mountain ranges to guide them. Wind patterns: A recent study at Cornell using crowdsourced data found that passerine birds are heavily dependent on wind direction for migration. By shifting routes, birds take advantage of stronger tailwinds in spring and less severe headwinds in fall. Learned Routes: Some bird species, such as sandhill cranes and snow geese, learn migration routes from their parents and other adult birds in the flock. Once learned, younger birds can travel the route successfully themselves. What do Bald eagles and Peregrines do? It seems they most likely use multiple sources of information, including celestial and magnetic clues, light polarization, wind patterns and direction, and geographic cues (which would likely be highly correlated with geography). Although parents and young don't migrate together, D1 and D14 were in the company of other eagles every time we saw them, so I suspect that some degree of learning, or at least following, also plays a role. While we haven't yet seen Four in the company of eagles outside her family, she's only begun her wandering. Since young bald eagles are much more nomadic than adult Bald eagles, we hope to have several more years of watching her. In addition to watching our eagles, keep an eye on the animals outside your window. We know fall is here, and so do they. Birds may begin gathering in huge premigratory flocks, gorging on food to build fat reserves, and exhibiting restlessness, also known by the marvelous word zugunruhe. These behaviors help prepare birds for migration. Keeping a well-stocked bird feeder helps them too. Juvenile peregrine falcons are on the move! You'll sometimes catch a stranger on cam as they disperse down river. Please let us know if you get any band numbers! Frogs and turtles may begin migrating from summering breeding grounds to deeper bodies of water. While their travels are short, they still fit the definition of migration. For more on frog hibernation, click here. The Minnesota DNR has a very good article on helping migrating turtles cross roads, some cities close roads, and volunteers help keep migrating frogs safe. Some insects migrate and others hibernate. Aggregating paper wasps may be getting ready to hibernate, while dragonflies migrate in large numbers (or check this source out). Watch out for migrating Mule deer! According to National Geographic, they make a 150-mile migration twice yearly from the low desert to the high mountains. * Regarding male Peregrine dispersal: of course, there are exceptions. We released Zeus, the male at Woodman Tower in Nebraska, in Rochester New York. We were very surprised when he showed up in Nebraska. Did he fly west intentionally or was he some how blown off course or lost?